CarrierBid Communications can help your company make the transition from traditional phone services to Session Initiation Protocol (SIP) and Voice over IP (VoIP). 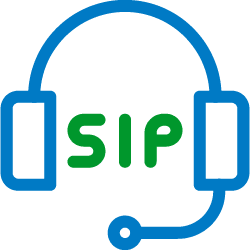 SIP trunks are voice paths over an internet connection. One SIP voice path is the equivalent to a single business phone line. But SIP provides a business with a great deal more functionality and flexibility than traditional phone service. Voice and data traffic can be transmitted over a single network. One network is more economical and is easier to manage and relocate than multiple networks. Call paths aren’t static; when they’re not in use bandwidth is freed up for data and other transmissions. With the use of Direct Inward Dialing (DID) phone numbers, SIP enables a business to oversubscribe their call paths. Businesses can order the number of trunks based on their call traffic instead of the number of people they employ or the fixed number that come with PRI. SIP permits the use of out of area DID’s, so a phone number with any area code or prefix can ring directly to any location in the U.S.
SIP DIDs can be rerouted in the event of a natural disaster. If a company location or call center is rendered unusable, SIP DIDs can be routed to another office or call center. SIP trunks can be purchased in any increment, unlike PRI call paths, which come in increments of 23. The call quality of SIP equals the call quality of traditional phone services. SIP is an important element in a wide area, private company network, like MPLS. With the reduced expense of bandwidth, SIP will eventually replace traditional phone services like POTS and PRI. If you’d like to receive more information regarding SIP or would like help with your company’s transition to SIP, please complete the form on the bottom of this page.